that it may impart grace to the hearers." That's why my blog, ever since that first post in 2007, has always been called Imparting Grace. I saw my blog as a bit of online property, a place to extend hospitality to all who might visit me. I wanted to bless each person who stopped by. Over the years, though, I've found that at times I've become distracted from that goal. Instead of wanting to bless people, it's been easy to fall into the trap of wanting to impress them. If I don't have something big or beautiful to share, I've pretty much stopped sharing. I've neglected my space here. I've practically stopped writing, unless I've felt that I had something impressive to share. In the process, though, I've stopped doing much of anything to bless. By God's grace, this is still my bit of online property, and lately He has shown me that if I'm willing, I can still extend hospitality here. But I'll have to change my habits. I've grown rusty at extending hospitality in this space. I need practice in sharing things just to bless rather than to impress. Today, I remember the words of Thomas à Kempis: "Habit overcomes habit." Yesterday was the first day of February. Yesterday I wrote a little post, sharing a fun and simple recipe. More than that, though, I started what I hope will be an entire month of a post for each day. Some will be simple; some will be short. Others will be more involved. Probably very few of them will be impressive. My hope, though, is that each one will be a blessing to someone. 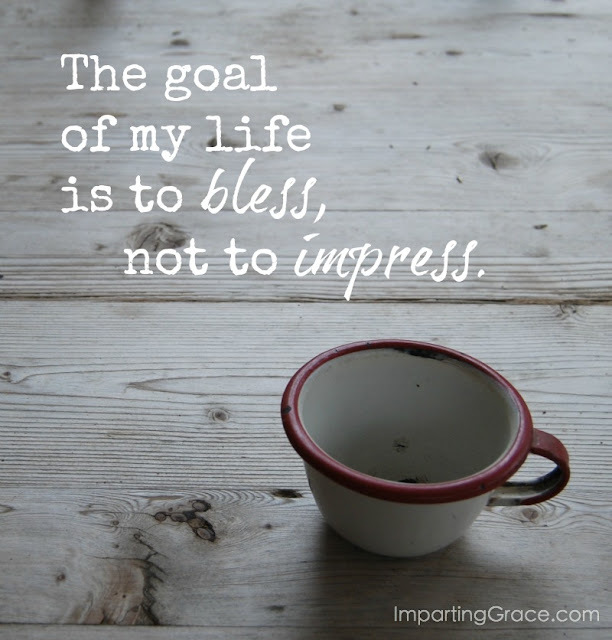 To bless, not to impress. And so, in some small way, to impart grace. That's my aim and my prayer. Do you ever struggle to keep your actions aligned with your goals? Will you join me for this journey? Oh, my goodness, Richella. You totally spoke what's been on my heart. I, too, have been lax in posting over the last several months. I have managed to keep the link party going and my Sunday Food for the Soul posts, but that's about it. I'm not sure if it's just the busyness of life, or the comparison game, but I have definitely felt less than inspired to put anything out there. I appreciate you sharing this today. You succeeded in blessing me ;-) Thank you. Your spirit shines through even when you don't think it does. It is great to see homes and such...I really do enjoy decorating posts. However, the thing I really like about blogs is sometimes the most mundane things. The thoughts of others...what is going on in everyday life and how they deal with it. It doesn't even have to have pictures. Just real life! I say blog when you feel like it though. It should not be a chore. Life has enough stress without adding to it or trying to live up to expectations that we often put on ourselves. I have felt nothing but kindness since I first visited your blog, Imparting Grace, until now, dear friend!!! You have always extending the hand of hospitality to me and I am truly, blessed!!! I began my blog, to have a voice for my creative writing and to encourage and inspire others to enjoy the process of homemaking!!! The retail business, a small Antique and Gift Shoppe, where I was employed $old. I decided not to continue under the new owner and she wanted to employ her daughters. I am thrilled that this week she celebrated her 5th year in business with her daughters, son and husband by her side!!! Many of my past costumers missed my"touch" in home decor and they follow my blog through Facebook!!! I pray that you will continue your blog as God guides and directs your journey!!! I will be thrilled to follow along with you, dear one!!! I agree with Sandy, above. Richella, when I started looking at blogs several years back, yours was one of the first ones I read and started to follow. Once I started blogging myself, you were also one of the first ones to encourage me and and I have never forgotten that. I appreciate what you are saying here and the bloggers that I appreciate the most are the ones who really share what is on their heart...whether it is the mundane, everyday stuff of getting by from day to day or sharing a special recipe...or whatever. It doesn't need to be the same everyday, it just needs to be from your heart, which in my opinion is quite beautiful. May the Lord guide and direct you what He want you to share on Imparting Grace. Hugs! Hello, This was refreshing to read! I remember first meeting you and thought we would be great blogging friends. But I do think we were in different circles of what we blogged about. But you my friend have always been very kind and gracious to me personally! I do hope your family is well! It will be a good thing for you to blog about what matters to you! I think you always Bless and I look forward to more. Well said, my friend. I have not posted in months because I have been so busy with life that I haven't completed any projects that are "blog worthy". I have seen so many young mothers in particular who have become slaves to their blogs and I have been determined that I will own the blog and it will not own me. Perhaps I should post an update that I'm busy living life. I will look forward to reading every one of your posts this month! I don't always make it here and rarely comment but I can not think of a time when I have left here without feel Blessed. May you continue to do so for a very long time. This is such a lovely post and a good reminder to all of us. It may be easier said than done for some who have "for profit" blogs and feel the need to always have fresh & exciting things to share. There are so many bloggers in just about any category you could think of, and that does create competition. Some are able to handle the competition gracefully, but others really struggle. As a "not for profit" blogger, I feel myself getting annoyed with all of the pop-up advertising, but I try to remind myself to be gracious....these bloggers are just trying to have a little extra income. For me, blogging is a creative outlet for writing & sharing. I write posts when I feel like it and when I have something to share. I know you are a very kind-hearted person, Richella, and will do what feels right for you. I love this post, Richella and can totally relate. I started blogging during a dark time, because I wanted to write, share my thoughts and point out the beauty in the everyday. I was completely unfamiliar with blogging, but started getting featured pretty quickly for home decor and I sometimes stifled my own voice, because those posts were less impressive, as you said. I too decided this year to return to my roots and intention. I wasn't sure how it would be received, but after my last post, I realized that being true to myself is where I need to be. Thank you for sharing. I have been blessed by every blog here at Imparting Grace! I am not a blogger. I am not a creative writer (although I am a book editor). However, at the beginning of this year I felt God speaking to my heart in much the same way. Instead of spending my Facebook time commenting on things I feel to be frivolous, I heard Him say to look for places to share His Word and encouragement - even to those I know are not believers. We live in a hurting world, believers and non-believers, and it is my responsibility to share Jesus and God's healing, salvation and peace. Nothing more than a dollar sign?